A Heartrending Memoir: Georgina Scillio reviews ‘An Imaginary Mother’ by Bron Nicholls. An Imaginary Mother by Bron Nicholls. Black Pepper Publishing 2013. This heartrending memoir by Bron Nicholls of her ‘strange mother’ is well written and hard to put down. Nicholls’ relationship with both her parents, especially her mother Phyll with whom, naturally, she spent more time, was very difficult. Often Nicholls was given contradictory messages and the more she tried to please her secretive and unpredictable mother, the more her mother frustrated her and belittled her efforts. As a child Phyll and her younger sister Meg had been sent to Sutherland House, an orphanage for destitute children at Diamond Creek in Victoria. They were neither destitute nor orphans and never forgave their father for having sent them there. At the Home they were not ill-treated but their hair was cut short, they had very few possessions, the food was meager and they were made to work hard housekeeping or in the farm. Phyll retreated into books and became an avid reader for the rest of her life, often living out in her head the events of the books she read. It was an escape into an imaginary life which caused her to ‘block’ out many things, including her family. One of the main flaws of the narration in An Imaginary Mother s that Nicholls calls her mother ‘Phill’ and at other times—sometimes in the same paragraph—she calls her ‘Mum’. Again, with her father, he is both ‘John’ and ‘Dad’ when just she or he would have been clear enough. At times, this proved confusing and one had to re-read the piece to find out who are the people mentioned. There are also sections of the story where we are left wondering what happened next. For example, the horrendous bus trip with Nicholls and Nicholls’s very sick sister was described in great detail and is very moving. But as the author changes subject immediately, the reader is left high and dry and not knowing what was wrong with girl: did she recover? Later on in the story, the girl reappears, so we can assume she did not die from whatever sickness she had been suffering. In another instance, the author and her mother are sitting on the verandah, waiting for the father to arrive as he was late from work. The reader becomes anxious and worries: did Dad have an accident? Did he arrive home safely for dinner? But instead of answering these questions for us, Nicholls talks about her beloved dog, Jelly Roll, who is now old and who has to be put down by the vet. We get the impression that there is more affection for her dog, than for her father. What was also sad about the author’s childhood is the way her Christian fundamentalist father’s rigid beliefs blighted his family’s lives and especially that of the author. When Nicholls tried to escape, she ended up in more trouble. She states very briefly (one sentence) that she got married to the violent young man with whom she had fled. We are not told why and how she decided to make such a seriously bad move and we are left rather puzzled: if she knew he was so unpleasant, why did she marry him? Was her desperation that great? The marriage did not last long and she continued moving from place to place—she moved house more than 40 times—at times leaving jobs and friends behind her. She admits to be following the example of her parents, especially her father, whose restlessness made him continually change jobs, suburbs and States. There are some bad luck stories, but Nicholls does not indulge in self-pity, on the contrary, she blames herself for when things go wrong. The way she cared for her ill mother in the last years of her life is very touching, even though her efforts were not always appreciated. In spite of some shortcomings, this is a very worthwhile book to read, if not for anything else to learn about the consequences of mental illness on other members of a family. It is also a very interesting story about the struggles, both financial and social, of many Australian families in the early and middle part of the twentieth century. The book has several photos of the mother, the author and her family and is an excellent way to engage the reader. 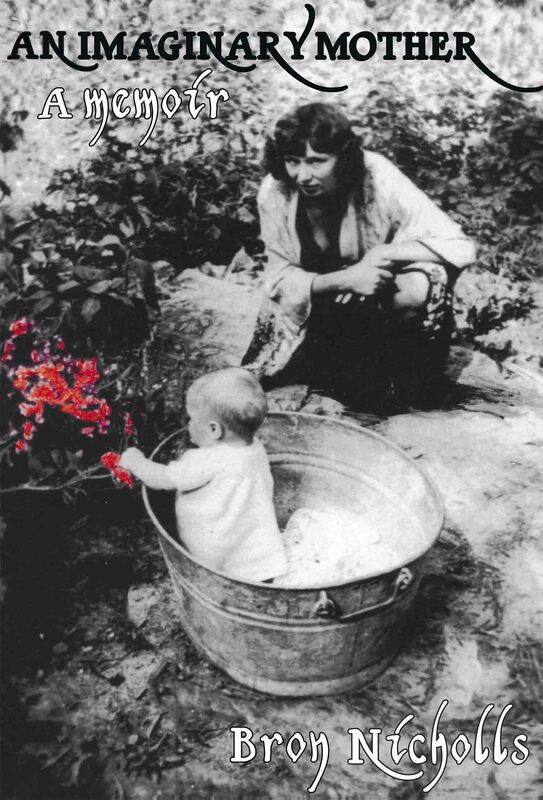 The front cover, a photo of the mother, with the author as a baby in a washing tub in the garden, is rather delightful. Georgina Scilliohas had work published in Quadrant, Arena, The Australian and several other literary journals. Her collection of short stories A Dandelion on the Roof won first prize in the 2008 Northern Notes Writers’ Festival. This entry was posted in An Imaginary Mother, Black Pepper Publishing, Bron Nicholls, Georgina Scillio, Issue 7 and tagged Australian Literature, Australian Memoir, books, literature by Mark Roberts. Bookmark the permalink. beautiful book by a great author.